HoSo thinking of something interesting to write and talking about a friend about my rap nemesis 2 Chainz and I still cannot fathom really why people are fans of this guy. But I digress because it made me want to examine my life through the music and times when I was affected by it. This is an ongoing series to just reflect on what I was hearing, when I was hearing it and what was going on at the time and the prism with which I took in the music and how I think I felt then and how I feel about it now. To start, the first cd I ever got I still have, Young M.C. 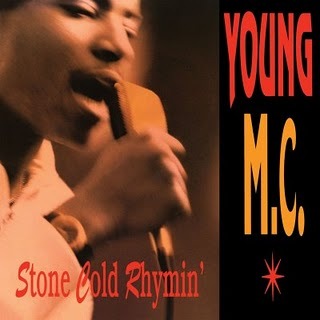 's "Stone Cold Rhymin'" . Music wise, Young M.C. is a serious throwback to a simpler time when cowbells ruled and meant it was time to get hype. Young MC wasn't talking about anything serious, just having fun and that is definitely something that is missing in hip-hop these days. His two hit singles were "Principal's Office" and "Bust a Move" which seriously rocked. I just remember getting this cd and I'm not sure if it was for Christmas or not, nor do I remember listening to it straight through but it was cool. Still a decent listen if you get the chance, but this was a nice segue into hip-hop because it wasn't too raunchy or 'grown'. Honestly those were the good days, when r and b was also into a funky state and it was danceable and words were literal poetry and not so straight forward as to take all of the mystery out of the music. What was your first cd and what do you remember about it? Labels: 90's hip-hop first cd hip-hop west coast Young M.C.